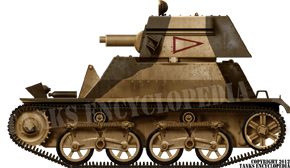 The tankette concept was invented by Major Giffard LeQuesne Martel, who built a small armored vehicle in his own workshop. It was a new concept, meant to cheaply motorize the army and also serve for supply and artillery towing. 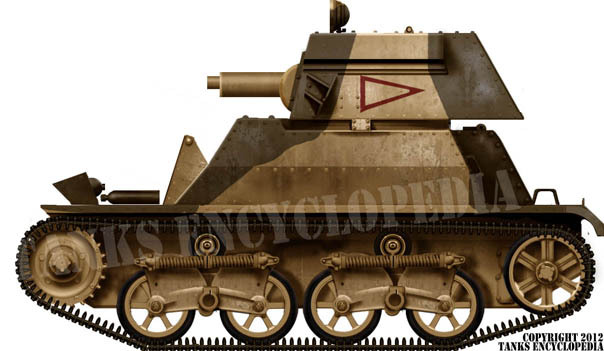 With the success of his prototype, and after many modifications, a very successful series emerged in the shape of the Carden Loyd Mk.VI tankette, which was largely exported. Besides the numerous customers for this cheap and fast light vehicle, many armed derivatives were built. The development of the turretless versions, which was carried out by the Experimental Mechanized Force unit, led to the formidable Universal Carrier series, of which over 100,000 were produced. 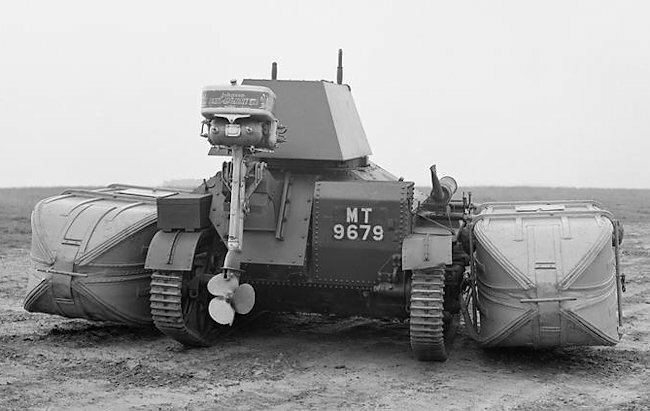 On the other hand, the Royal Tank Corps requested a turret-armed version, in order to test its tactical potential. 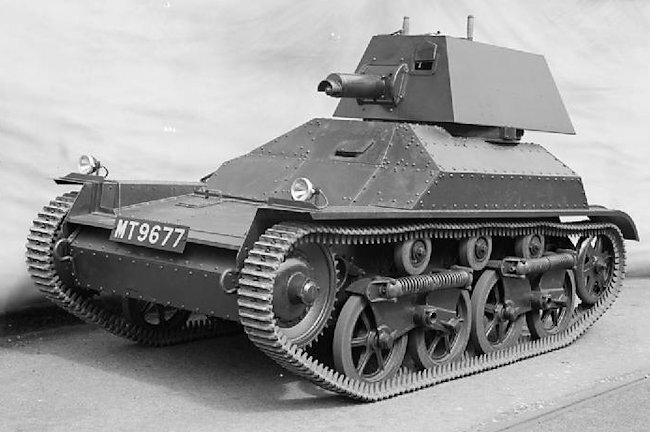 This led to the development of the Tank, Light, Mk.I, developed by Vickers, which also hoped to have, if the army rejected it, another cheap successful export light tank. It has to be said that the dark economical context of these years favored these light models which appeared cheaper and easier to maintain, with better standardization, and requiring only two men each. Besides this, they were intended for police duties in the colonies, not front-line action. 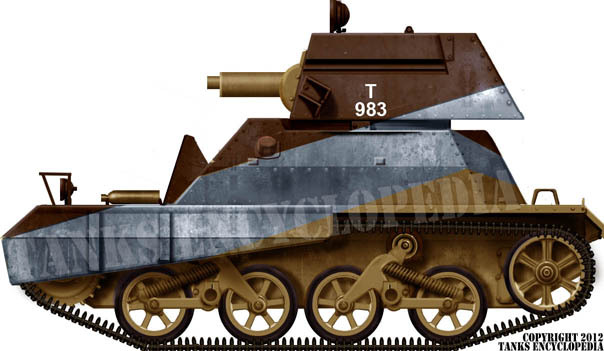 The Carden-Loyd Mk.VII tank prototype was the chosen basis for the new light tank, and the Vickers team choose to fit a tall cylindrical turret on the rear part of the initial casemate. It was naturally equipped with a reliable Vickers water-cooled .303 caliber (7.7 mm) machine-gun, in order to test tactical possibilities of such an arrangement. 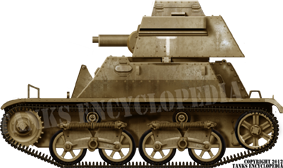 The added weight required a revised suspension, which still shared most elements with the standard tankette, with two bogies with two standard wheels each, suspended by Horstmann coil leaf springs, the same tracks, a tensioner connected to the back idler, and three return rollers. This solution had already been tested for great speeds. However, the air-cooled Meadows 6-cyl petrol 59 hp engine remained unchanged, with a 12.1 hp/ton ratio giving a slightly reduced speed of 51 km/h (30 mph, road only). Steering needed a clutch-brake system (the driver had to declutch the drive from one track and brake to increase the turn speed) and transmission was obtained through a mechanical four speed gearbox. 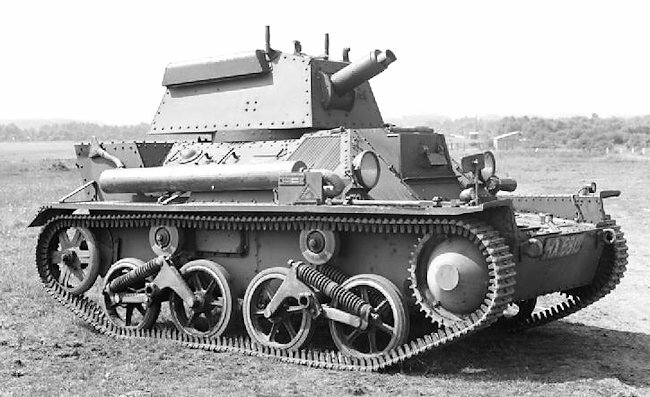 The first version, the Mk.I (army designation Vickers A4E4) basically had a straight sided armored box, the fighting compartment had a frontal outgrowth with vision slits on three-sides for the driver (which sat on the left) and a centered turret similar to the twin-turret version (Model A) of the Vickers 6-ton light tank. The armor was only intended to protect the crew from rifle bullets and light arms fire, being only 4 mm (0.16 in) (roof and bottom) to 14 mm (0.55 in) (glacis, sides) strong. A total of 10 were built, 5 Mk.Is which were thoroughly tested and later served as training tanks, and 5 Mk.IAs, the pre-series version, which differed in many ways. The Mk.IA had a larger, sloped superstructure, a larger turret and Hortsmann suspension replaced the previous leaf spring system. These springs allowed a smoother ride, but with some heavy bouncing on rugged terrain, which did not help to maintain the direction. They were sent to be tested in India, were they remained until WW2. The whole series was experimental and was never serviceable. The Mk.II was closely based on the previous Mk.IA, but with many modifications, including a shorter and larger hull and a roomier fighting compartment. It was one of the first vehicles to have Cemented Tank Armour, which allowed thinner, although stronger plating. They also featured a new Rolls-Royce gasoline 6-cylinder engine coupled with a transmission and preselector Wilson gearbox placed on the right hand side of the tank. Consequently, the driver and turret were relocated to the left. The Vickers machine-gun model was a modified pistol grip version, protected with a 10 mm (0.39 in) strong external mantlet, and fed by 4000 rounds. The rectangular turret was large enough to accommodate a radio at the rear. The casemate was sloped, but visibility was somewhat reduced. Production was assumed by Vickers-Armstrong (16 Mk.II and 21 Mk.IIB) and the Royal Arsenal of Woolwich, which delivered 29 Mark.IIA. These were modified versions for service in India. They had a better cooling system, a more powerful Meadows EPT 6-cyl 85 hp engine and a crash gearbox. Many Mk.IIAs and Mk.IIBs remained in India prior to WW2. 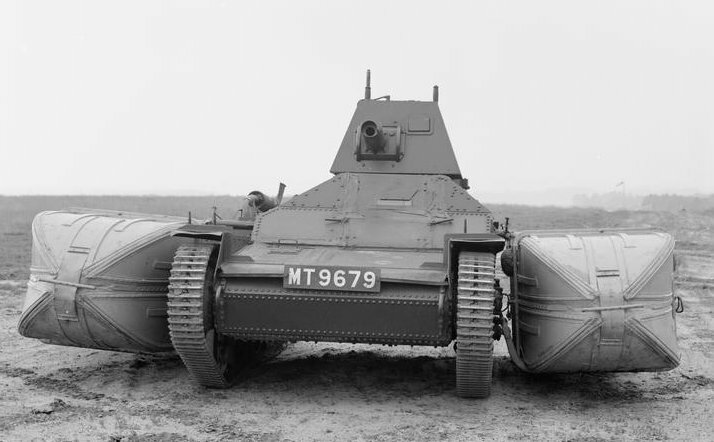 The Mk.II had no air louvers on the turret sides and a sliding roof hatch. The Mk.IIA had two fuel tanks, air louvers, and a folding hatch with two doors. “Indian pattern” Mk.IIBs were equipped with an extra squared cupola over the turret. Upgrades included anti-bullet splash baffles, Rolls-Royce engine, and dual spring system. 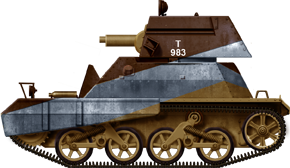 The Mk.III tanks were almost identical to the previous Mk.II, but, because of stability problems, they were fitted with a new, revised turret, slightly narrower to reduce its weight and still equipped with air louvers. Cooling was the main preoccupation of the designers, as these tanks were all supposed to serve under the hot climate of India. 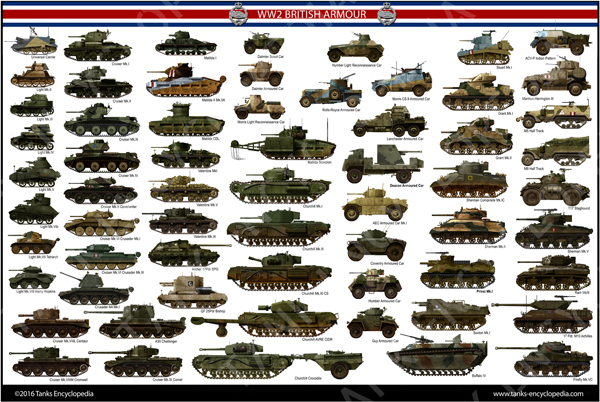 42 tanks were built by Vickers, in a single model. They were shipped to India shortly after completion, and were still based there at the start of WW2. This evolution didn’t stop there. The next generation, the Mk.IV, was a completely new design, with a new revised suspensions and a much taller hull. This successful version (34 built) was followed by the Mk.V, which had a two-man turret, raising the crew to three, and a new Vickers heavy .50 caliber (12.7 mm) machine-gun, coaxial with the .303 caliber (7.7 mm) machine-gun. This armament was intended to give them some effectiveness against other armored vehicles. 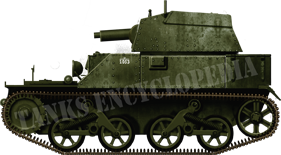 After 22 of these units were built in 1936, the design was revised once more time to give the excellent Mk.VI, which was the workhorse of the British light tank force in the Far East and Africa during the first years of WW2. 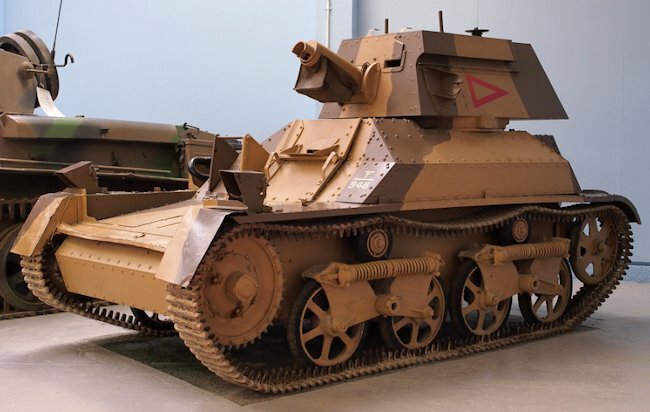 Being weakly armed and armored, these tanks were considered a compromise between armored cars and more effective tanks. However, their two main advantages were speed and cross-country capabilities. After initial cooling problems in colonial service, they served with distinction in India throughout the interwar, dealing with various tribal insurrections and local rebellions. The few which were kept home served as training tanks. By 1941, most Mark IIs were shipped to Eastern Africa to take part in operations against the Italian colonies of Abyssinia and Eritrea. In this “forgotten” theater of war, these tanks had reasonable success, due to clever tactics in conjunction with Australian infantry squads supported by armored cars, and weak opposition (the Italians mostly had obsolete guns and CV-33 tankettes there). 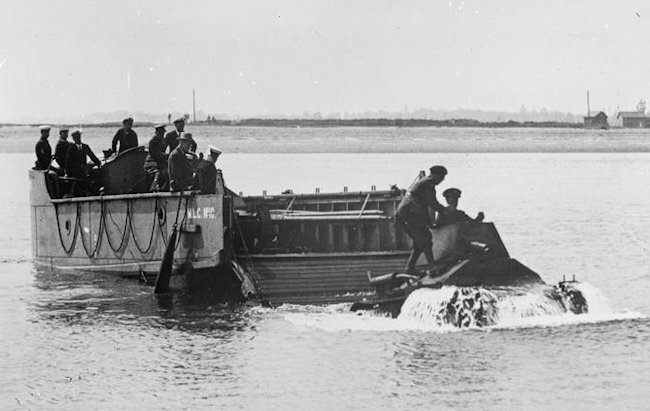 In 1930, three Vickers Mark II Light Tanks (A4E13, A4E14 and A4E15) were used for floatation trials. Large buoyant boxes with a cone shaped front and rear were fitted to the sides of the tanks. 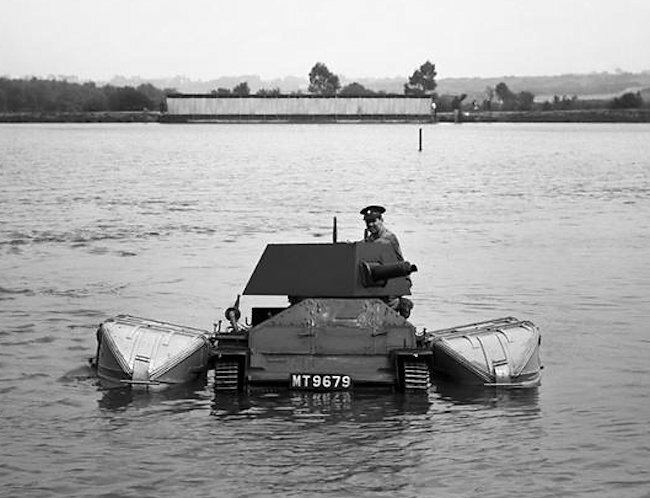 A motorboat’s outboard marine motor was fitted to the rear of each of the tanks. 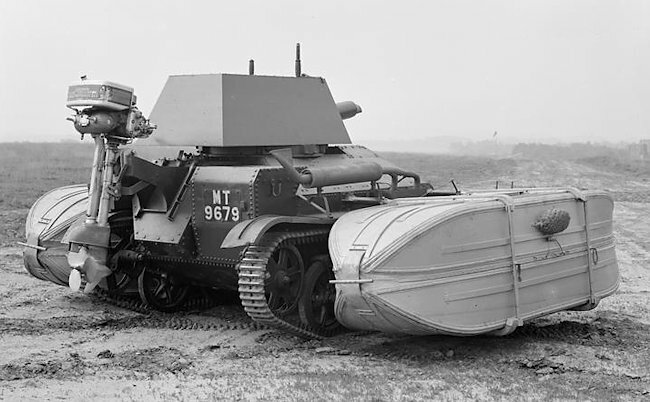 They first did tests on how deep the water could be to safely drive a Mark II tank off a landing craft. Light Tank Mk.IIA, unknown unit, probably Australian, East Africa, August 1940. Light Tank Mk.IIB Indian Pattern, here with a recognizable square cupola, better engine, better hull cooling and a more powerful Meadows EPT 85 hp engine. 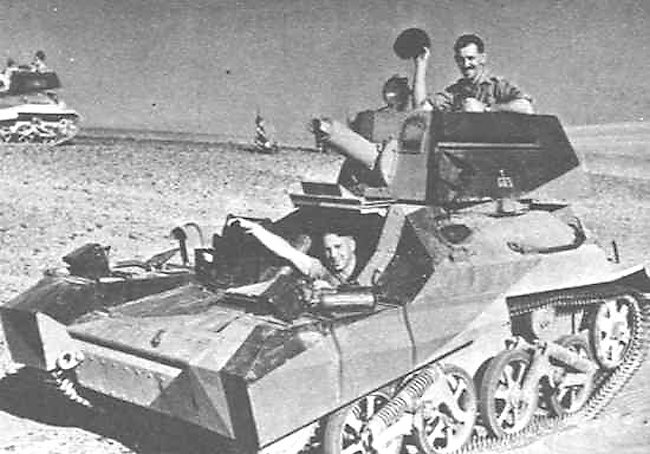 Light Tank Mk.II, 6th Australian Cavalry Division – Egypt, 1941. 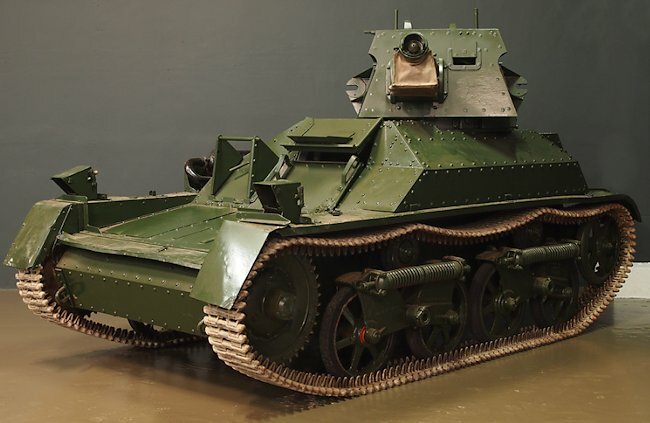 Light Tank Mk.III, the last of this lineage derived from the Mk.VI tankette. 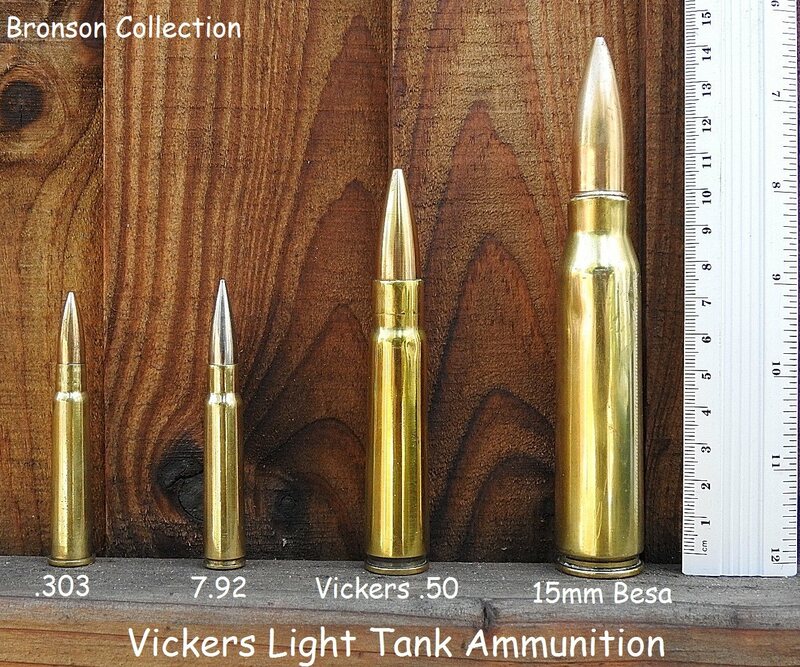 The cartridges used by all of the versions of the Vickers Light Tanks. The Mk.I, Mk.II and Mk.III all used the 7.7 mm (.303 in) Vickers watercooled machine-gun, the shell of which can be seen on the left. Source: Bronson, British Collectors of Arms & Militaria Forum. 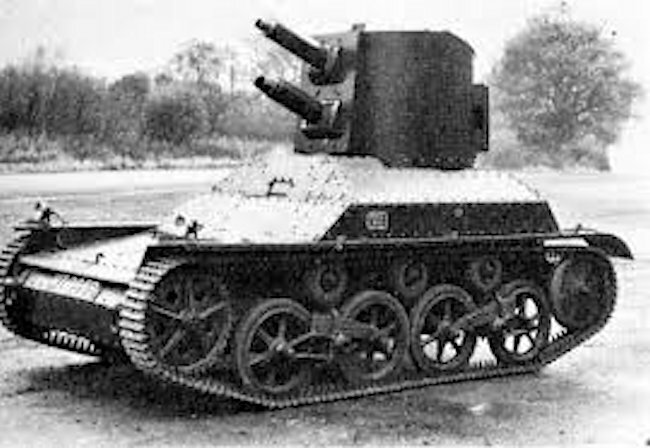 An experimental A4 (Mk.IA), fitted with a turret featuring twin Vickers machine-guns in tandem. The same Vickers Mk.II Light Tank at The Tank Museum, Bovington but painted in desert camouflage. Your comment about the Light Tank Mark III is incorrect when you state that, ” 42 tanks were built by Vickers, in a single model. They were shipped to India shortly after completion, and were still based there at the start of WW2″. In fact, Mark IIIs were in Egypt from at least 1937 and possibly 1933 with 6th RTC. Certainly by 1937 there were 53 light tanks marks II and III in Egypt, where they remained until eventually used as training vehicles there. By 1st March 1941 there were still 19 Mark III listed in the inventory of fighting vehicles in the Middle East. Also 12 Mark III were sent from Egypt to equip 1st South African Light Tank Company for the East African campaign.